Progeny Press offers literature study guides with a Christian perspective for your homeschool. 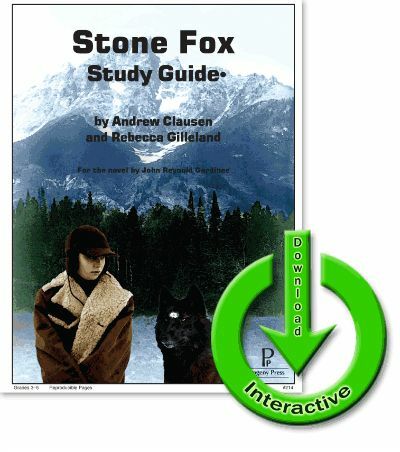 When the Schoolhouse Review Crew recently had the opportunity to review their selection of literature study guides, I chose the Stone Fox downloadable digital study guide for grades 3-5 to use with my son in our homeschool. Each Progeny Press study guide is designed to help your student enjoy the literature they read by understanding how the story is crafted and helping them think through the ideas and themes presented in the story. It is recommended that your student has access to a dictionary, a thesaurus, and a Bible while working through their literature study guide. At times, they may also need access to the Internet, a topical Bible or concordance. You will need to visit your local library to check out the novel book or you can purchase it at your favorite bookstore. It's recommended you take 8-12 weeks to complete a study guide doing one page per day. Your student will be able to complete 3 to 4 literature study guides per year going at this suggested pace. The elementary guides will not take as long to complete. Concerning high school credits, most Christian high schools have given a 1/4 credit for each literature study guide. You can view a sample of this literature study guide on the Progeny Press website. I really like the interactive literature study guides from Progeny Press! I love that your student can type their answers into the PDF file and save their work along the way. This is great if you have a boy like mine who doesn't like to write. It's also great that I can go in and check his work when I'm ready, and I can type in my comments about his work and grade it right there in the file! This makes for less paper clutter in our homeschool which is a big plus! There are some pages that we needed to print in order for my son to complete. The pages you need to print in the study guide are clearly marked with a highlighted notation. "To teach our children to think clearly, to understand literature, and to rely on the Scripture for truth and values, and enjoy themselves while they do it." My son loved the story, Stone Fox! This is the story of Willy and Searchlight, a boy and his dog who enter a dog sledding race in hopes to save Grandfather's farm with the prize money from the sledding race. The only problem is Willy is racing against Stone Fox - an Indian who has never lost. If you are looking for literature study guides with a Christian perspective, I highly recommend Progeny Press for your homeschool! Read more reviews from the Schoolhouse Review Crew simply by clicking on the image below.